At the start of the Sixties, motorcycling in Europe was heading into one of its darkest periods, America was rediscovering the joy of two-wheeled transport and Japan – led by Honda - was planning the revolution which would kick-start the world market. In 1959 Honda revealed its global ambitions, setting up the American Honda Motor Company and entering its first Tourist Trophy. In order to take over the New World and Old Europe, Honda devised a strategy based on customer psychology. No bikes seemingly designed exclusively for "experts" or juvenile delinquents: instead, Honda produced bikes that were popular and easy to use, thanks to built-in electric starters. Honda became the world's No.1 producer in 1960, building half of the Japanese industry's total output of 1,800,000 two-wheelers and exporting over 45,000. Five years later the latter figure was multiplied tenfold! Honda launched its top-of-the-range sports bike, the 250cc CB 72, in 1959; its near-twin, the 305cc CB 77 "Super Hawk", appeared in 1961. 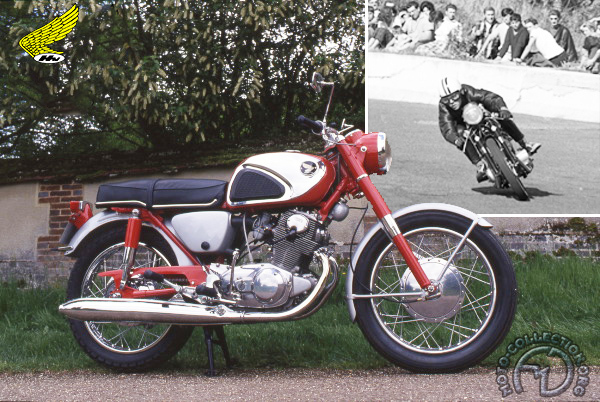 Honda's first real commercial success, it would overshadow the finest European marques right up to its replacement by the CB 350 in 1968. Its flowing lines contrasted with the marque's angular touring models and the CB 72 and 77 incorporated many innovations, like electric starters, four-bearing crankshafts (English bikes had two bearings!) and engines that ran at an unprecedented 9000rpm. With dropped handlebars, they were designed to be raced. Today a rare collectors' item, the CB7 is worthy of attention, though this preserved example has acquired rather more chromium plating than it wore when new.